Your guide to cheers-worthy fizz for every occasion. When guests gather around the patio table, offer glasses of bubbly and watch eyes light up. Fizz is festive and makes everyone feel welcome. It’s easier than ever to find appetizing styles of sparkling wine, spanning the range from slightly spritzy to exuberantly frothy. Three splendid bottles showcase different ways in which winemakers turn grapes into effervescent pours. On the northern coast of Spain in the Basque country, Ignacio Ameztoi cultivates Hondarribi Zuri and Hondarribi Beltza, local varietals that the seventh-generation winemaker turns into Txakoli (pronounced “cha-ko-lee”), the region’s traditional warm weather quaff. The white wine is bottled in tall, green glasses with just a dash of the CO2 that remains after fermentation in stainless steel. Served chilled, the pour is refreshing, uncomplicated, and sports a tingly prickle. Fifth-generation French winemaker Philippe Augis takes a multi-step approach to making sparkling wine in the Loire Valley. He uses the traditional method – the same process as Champagne – to create a frothy pink drink called La Rosée, made from estate-grown malbec. 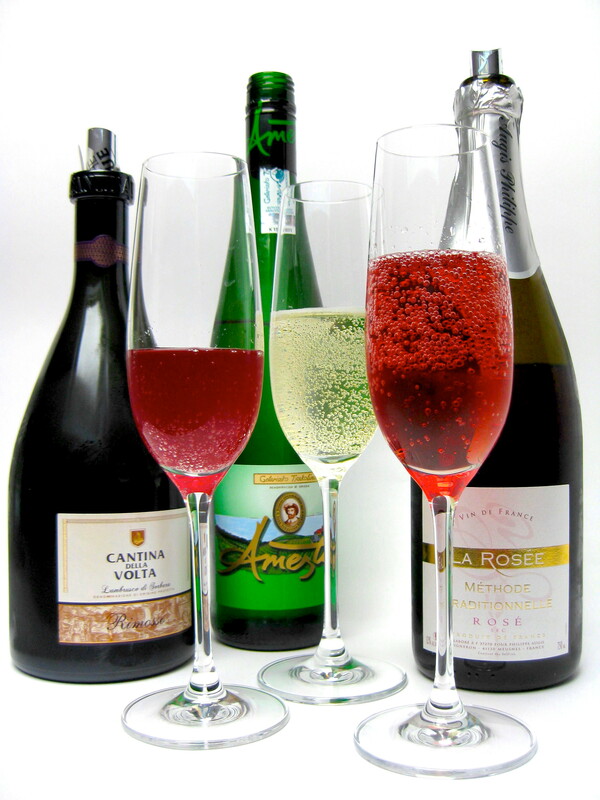 Bubbles are created through a second fermentation that takes place in the bottle in which the wine will be sold. Yeast sediment is later removed, and a little dosage (sweetness) is added. Don’t let the oh-so-delicate blush and gold label mislead; this rosé sparkler offers appealing body and flavors of lush red fruit. If you’re looking for a gentle bubbler characterized by dry, bracing tartness, a bottle of Lambrusco (made from lambrusco di sorbara grapes) crafted by producer Cantina della Volta in northern Italy’s Emilia-Romagna, fits the bill beautifully. Fourth-generation winemaker Christian Bellei makes a special version called “Rimosso,” a deep pink pour made the ancestral way, where wine that has yet to completely ferment goes into the bottle, forming bubbles that remain trapped until you remove the cork. Because the yeast sediment, called "lees," is not filtered out, a fine creaminess takes over in the last pours, lending delicious texture. All three of these sparklers are modest in alcohol (11 to 12 percent by volume) so you and your guests can stay light on your feet well into the evening. With these bottles, there’s plenty to effervesce about all autumn long. Ameztoi Getariako Txakolina 2014. This platinum-tinged white offers just a hint of spritz and clean, peachy aromas. Dry, yet round with stone fruit, pear, and tangerine, it offers lively acid that pairs with grilled fish, oysters, or scallop crudo. Around $20. At Winestone, Chestnut Hill, 617-264-0393, winestone.net. Domaine Augis “La Rosée” NV. Bubbles of this rosé sparkler fill the glass with generous froth, conveying scents of raspberry and strawberry, accentuated with white pepper and a bit of garden soil funk. The palate is ever so slightly sweet, but suggests ripe red berries and citrus rather than sugary sweetness. Terrific with a wedge of robiola or brie served with a crusty loaf. Around $18. At Social Wines, South Boston, 617-268-2974, socialwinesbos.com. Cantina della Volta “Rimosso” Lambrusco di Sorbara 2012. This bottle is like two bottles in one. Fine lees (yeast sediment) that collect at the bottle’s bottom results in an increasingly creamy-cloudy texture in the final pours. With gentle bubbles, the wine offers tart red fruit, rose petal floral, and a hint of saline that all ride high on the palate. Serve with cured meats and then on through the rest of the meal. Around $23. At Wine Sense, Andover, 978-749-9464, wine-sense.net.